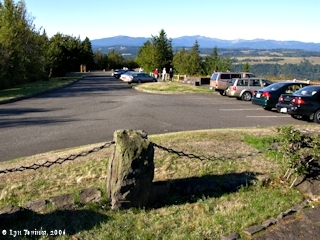 "Portland Women's Forum Scenic Viewpoint (Chanticleer Point), Oregon"
Click image to enlarge Crown Point (left) and Chanticleer Point (right). View from Tunnel Point Viewpoint, Interstate 84, Oregon. Image taken September 23, 2006. 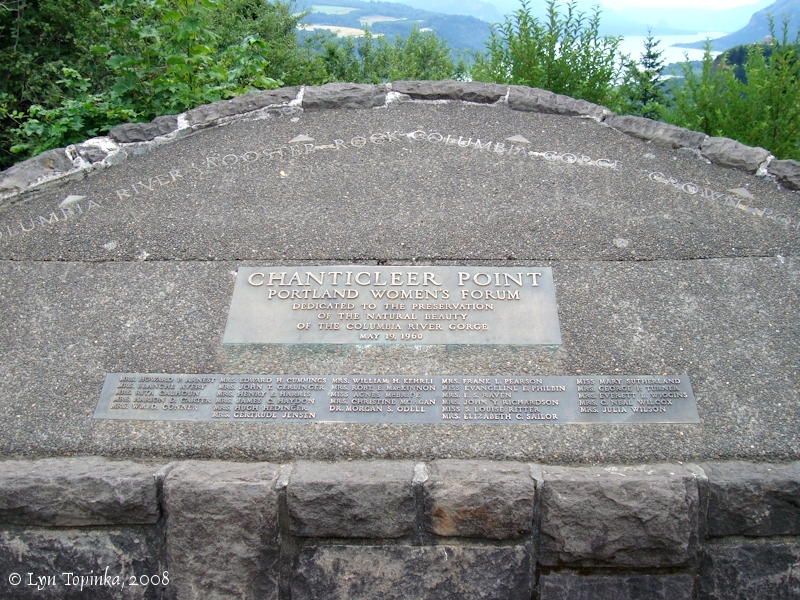 Once called "Chanticleer Point" and the home of a world-famous "Chanticleer Inn" (see more below), the location now is known as the Portland Women's Forum Scenic Viewpoint. Chanticleer Point is located on the Oregon side of the Columbia at Columbia River Mile (RM) 127.5. 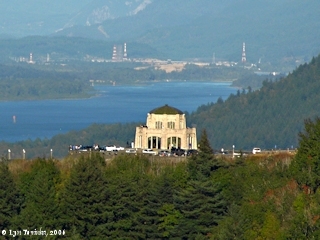 Upstream is Crown Point, Vista House, and Rooster Rock, and the historic View Point Inn. 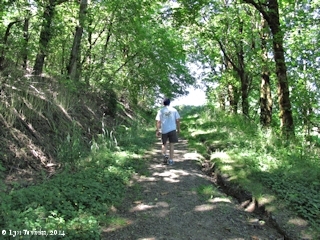 Downstream is Tunnel Point and Corbett Station, once a railroad stop on the Columbia below the community of Corbett. Directly across the Columbia on the Washington shore is Point Vancouver and the Steigerwald Lake NWR. 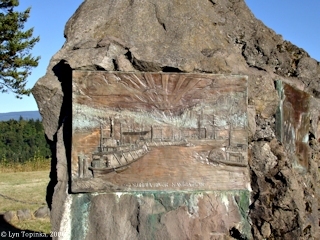 When the Chanticleer Inn burned down in 1930 the property was purchased by the Portland Women's Forum and donated to the Oregon State Parks amd Recreation Department. The Historic Columbia River Highway at Chanticleer Point/Portland Women's Forum Scenic Viewpoint runs along the headscarp of the Rooster Rock landslide. The continuous road exposures between Chanticleer Point and Crown Point are predominantly Troutdale formation. 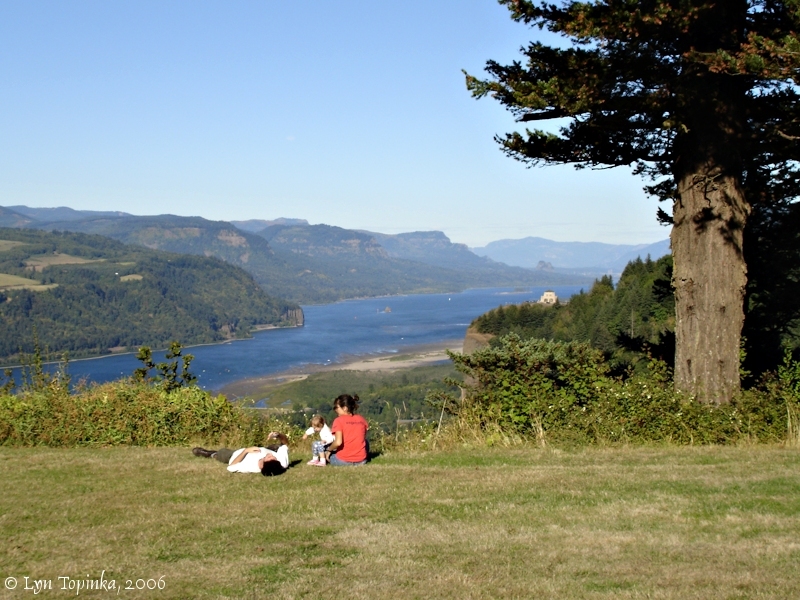 Once called "Chanticleer Point" and the home of a world-famous Inn, the location now is known as the Portland Woman's Forum Scenic Viewpoint. This spot offers spectacular views of the Columbia River Gorge and Crown Point and Vista House. 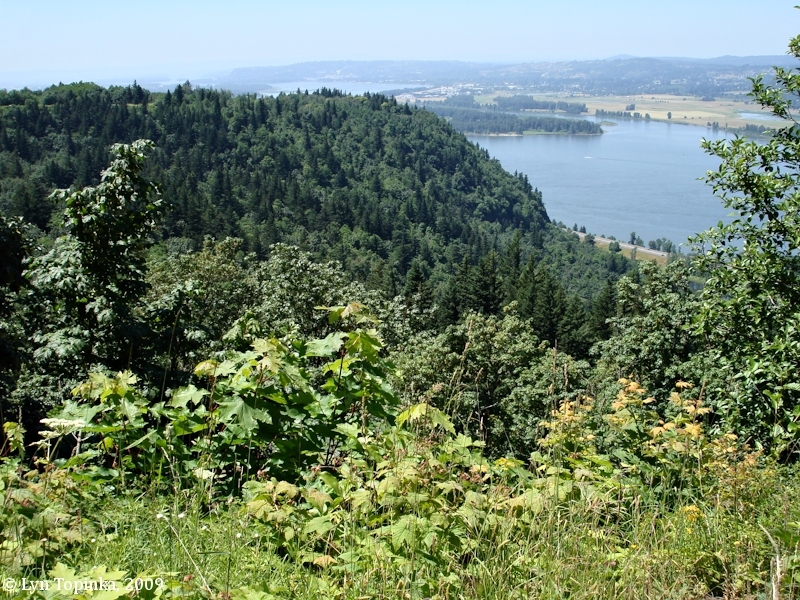 Portland Women's Forum State Park is located at Chanticleer Point, on the north side of Scenic Columbia River Highway, approximately 22 miles east of Portland and one mile west of the Vista House at Crown Point in Multnomah County. 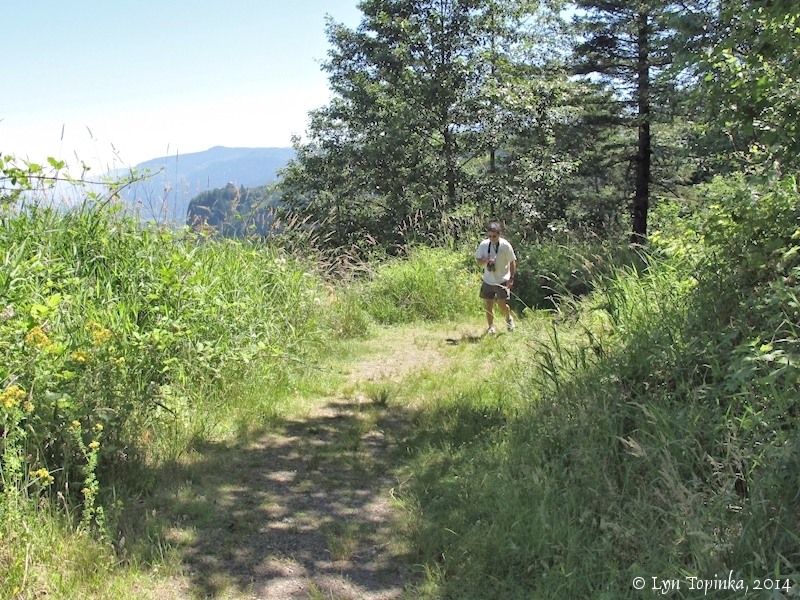 The 3.71-acre tract was a gift from the Portland Women's Forum by deed dated October 19, 1962. 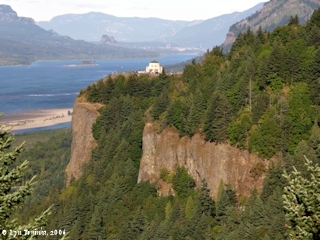 Preservation of the viewpoint at the west entrance of the Columbia River Gorge was the motive. 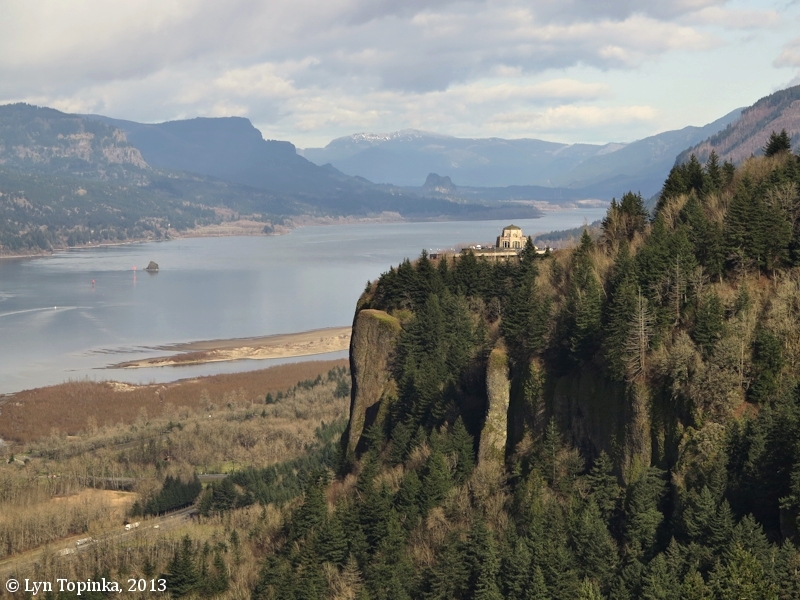 This property is the site of the old Chanticleer Inn which many years ago was located at a vantage point overlooking the great Columbia River, its magnificent canyon and the beautiful, green timbered mountains far to the north. The Inn was destroyed by fire nearly 40 years ago. As a condition of the gift, the Forum requested that the area be named Portland Women's Forum State Park, and the Commission approved. On the level ground near the car parking area, the Forum installed a memorial with arrows pointing to various landmarks and a bronze plaque inscribed with names of life members of the organization. The remainder of the land is a sloping hillside, covered with low-growing brush indigenous to the area. An old roadway is used as a car parking area. 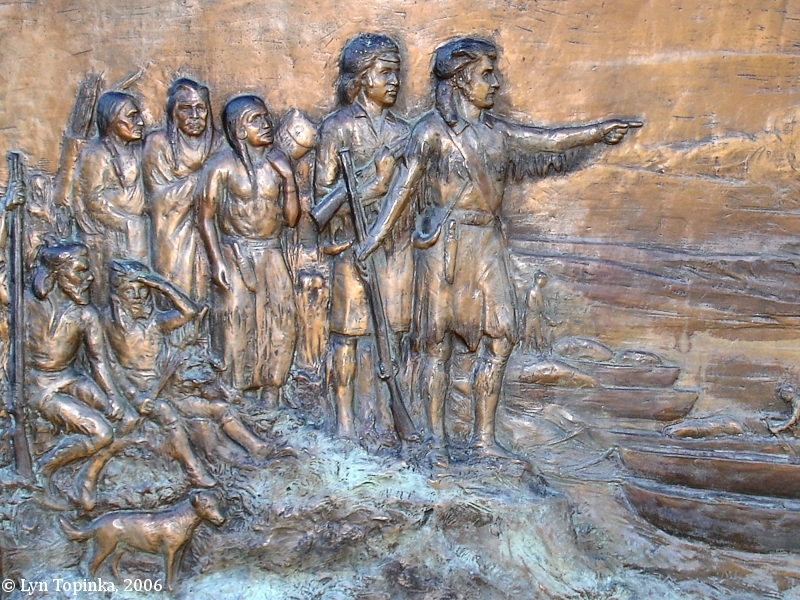 At the entrance to this park another monument has been placed to the memory of Samuel Hill, through whose efforts and influence the first road through the Gorge was constructed. No count of the visitors to the area has been made." 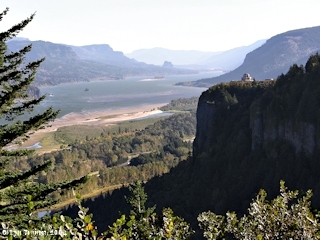 Click image to enlarge Chanticleer Point as seen from the View Point Inn, Oregon. Image taken June 27, 2009. 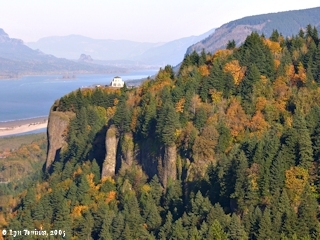 Click image to enlarge Chanticleer Point, now the Portland Women's Forum Scenic Viewpoint, with the Samuel Hill Memorial Rock. Image taken September 23, 2006. 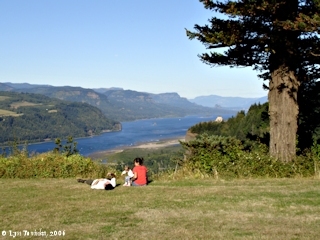 Click image to enlarge Portland Women's Forum Scenic Viewpoint (Chanticleer Point). View of the Columbia River and Vista House, located on Crown Point. Image taken September 23, 2006. 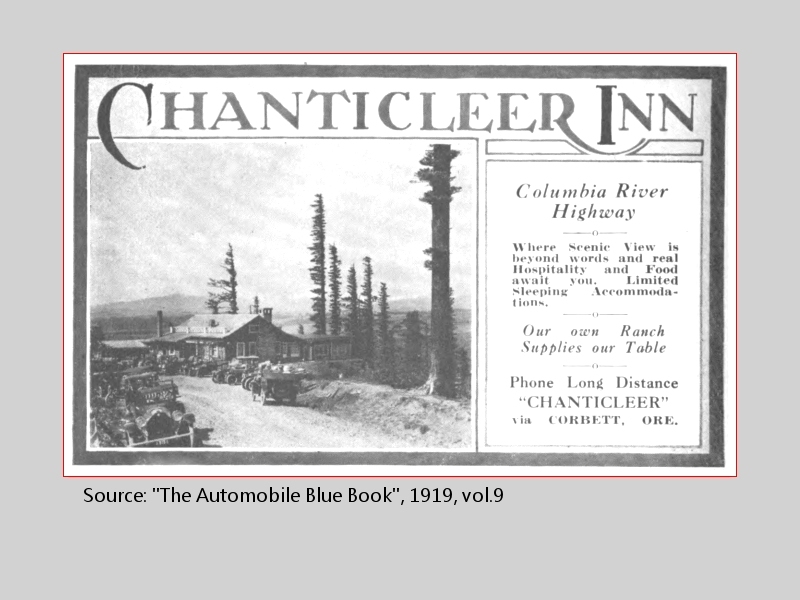 The Chanticleer Inn was built in 1912 before the construction of the Historic Columbia River Highway. 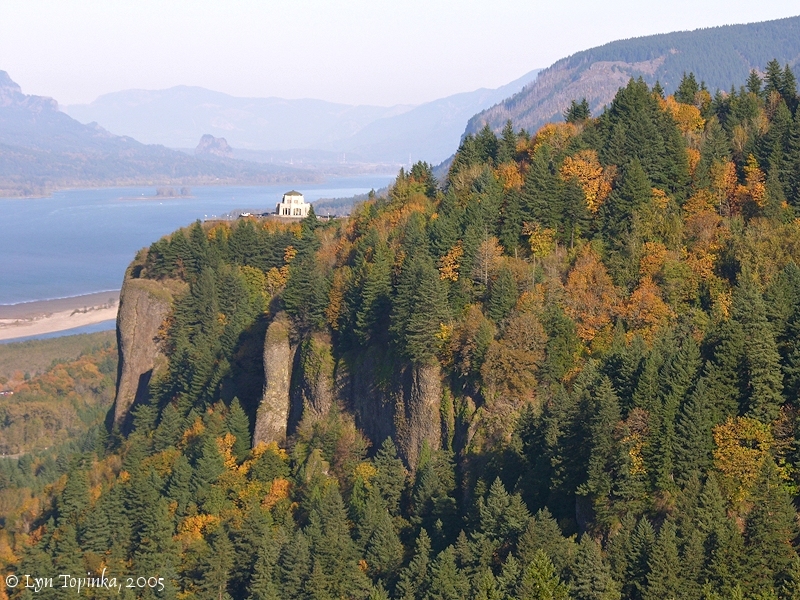 Access to the Inn was by train to the Depot at Rooster Rock, or by boat up the Columbia River to the dock, and then climbing steep stairs or taking a horse-drawn coach up a windy road (later a motorized coach). In 1915 when the Highway opened, access became easier and the Inn prospered. Chanticleer Inn burned down October 8, 1930. 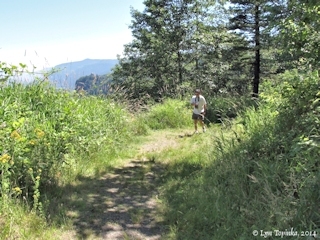 The site was later purchased by the Portland Women's Forum and donated to the Oregon State Parks amd Recreation Department. Click image to enlarge Penny Postcard: Approach to Chanticleer Inn, Columbia River Highway, ca.1916. 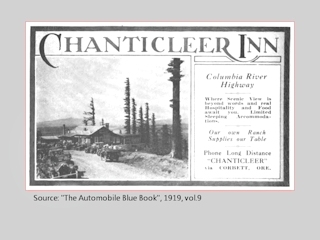 Click image to enlarge Advertisement: Chanticleer Inn, 1919. 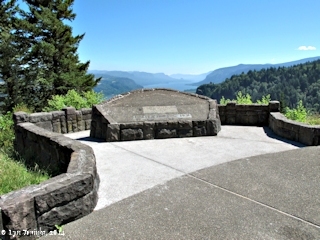 Click image to enlarge Monument, Chanticleer Point, Historic Columbia River Highway, Oregon. Image taken July 27, 2008. Click image to enlarge Crown Point and Vista House from Chanticleer Point. View from Portland's Woman Forum Scenic View (formerly Chanticleer Point). Image taken March 3, 2013. 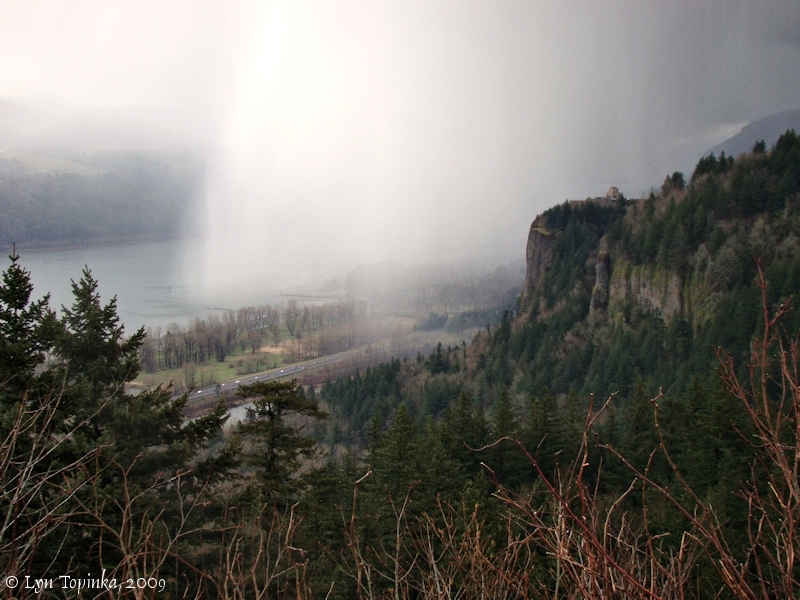 Click image to enlarge Columbia Gorge rain shower, Crown Point as seen from Portland Women's Forum Scenic Viewpoint. Image taken March 22, 2009. 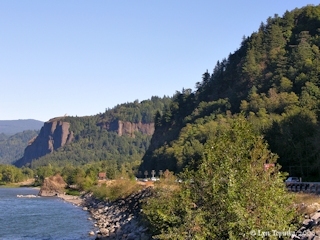 The Rooster Rock to Chanticleer Road (also known as the "Rooster Rock Wagon Road") started at rail station near the Rooster Rock Cannery and wound it's way up the basalt cliffs to the Chanticleer Inn at Chanticleer Point, today the location of the Portland Women's Forum Scenic Viewpoint. 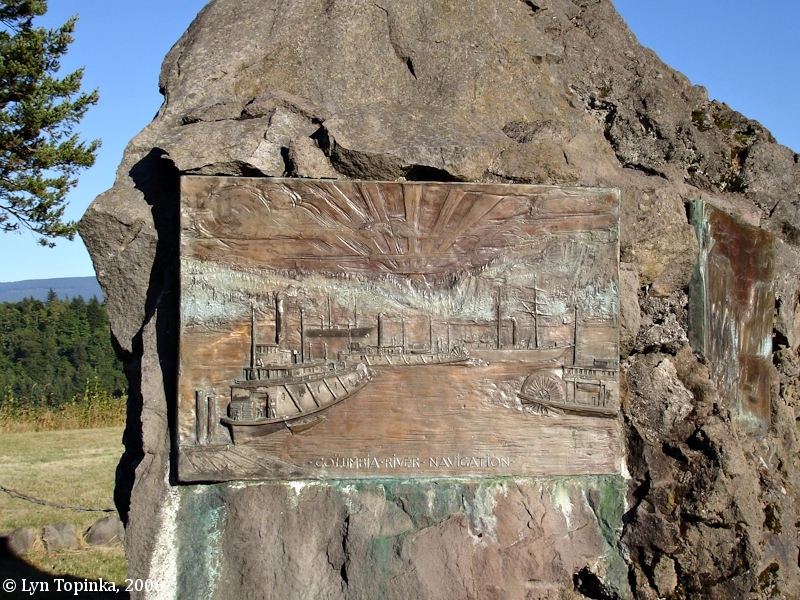 The large 50-ton basalt boulder at the entrance to the Portland Womens' Forum Scenic Viewpoint was erected in the 1930s as a tribute to entrepreneur Samuel Hill, an early promotor of the Historic Columbia River Highway. (Hill also built the Maryhill Museum, originally a home for his daughter, and the Stonehenge Memorial as a tribute to War Veterans from Klickitat, Washington.) 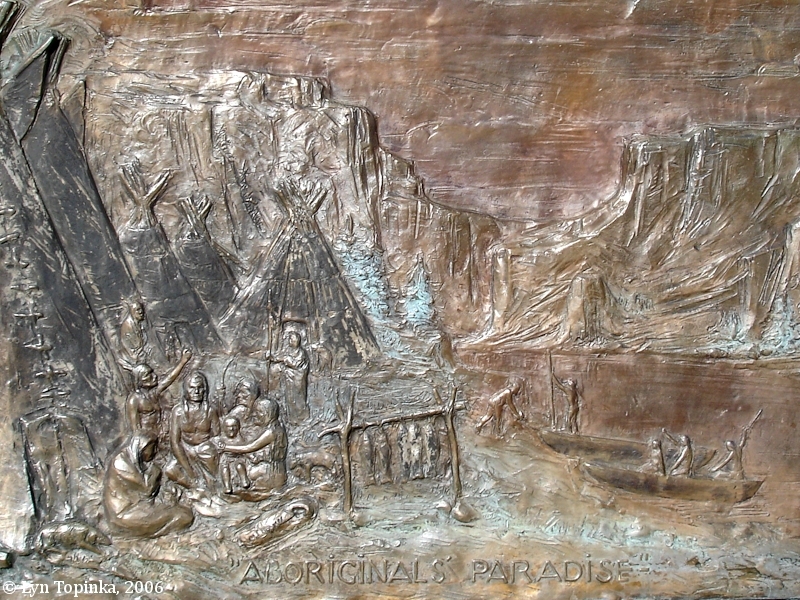 A bronze profile of Hill and four large bronze bas-relief plaques circle the rock. The plaques were the work of sculptor Alonzo Victor Lewis. 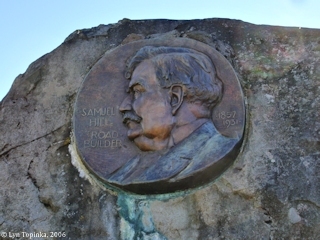 Three of the plaques depict Columbia Gorge history and the fourth was dedicated to Hill. The basalt boulder was quarried at the Rocky Butte Quarry located downstream. Click image to enlarge "Samuel Hill, Road Builder", Bronze, Portland Women's Forum Scenic Viewpoint. Image taken September 23, 2006. 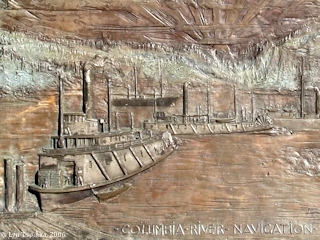 Click image to enlarge "Columbia River Navigation", Bronze, Portland Women's Forum Scenic Viewpoint. Image taken September 23, 2006. 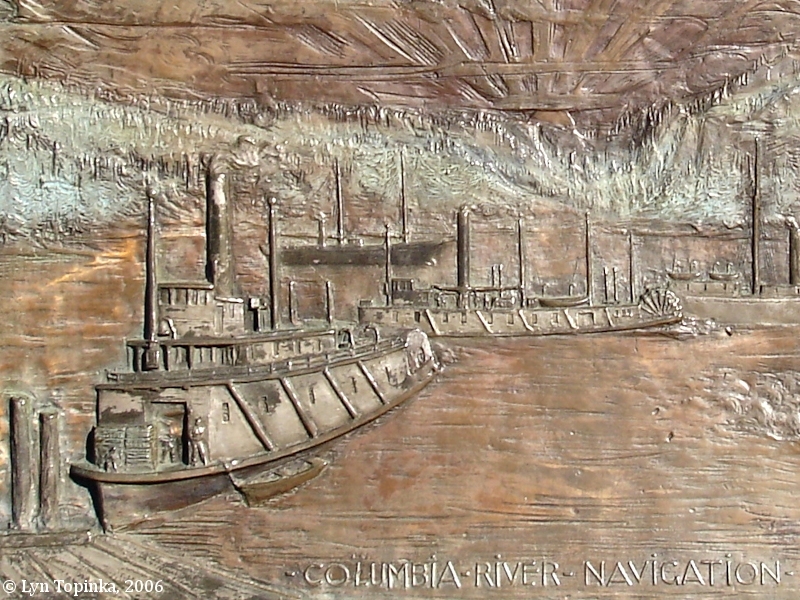 Click image to enlarge Detail, "Columbia River Navigation", Bronze, Portland Women's Forum Scenic Viewpoint. Image taken September 23, 2006. 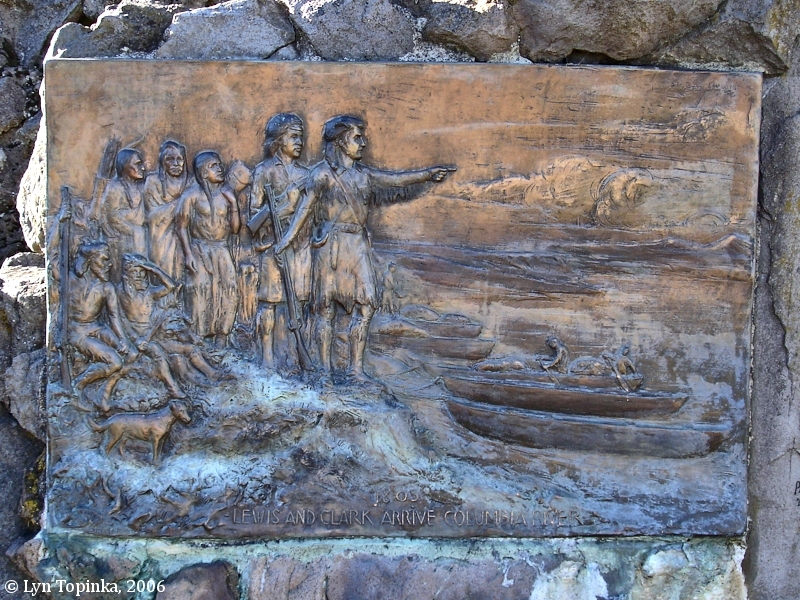 Click image to enlarge "Lewis and Clark Arrive Columbia River", Bronze, Portland Women's Forum Scenic Viewpoint. Image taken September 23, 2006. 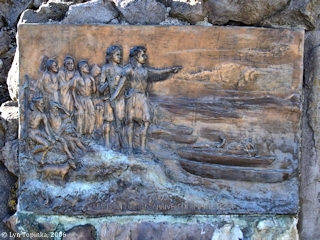 Click image to enlarge Detail, "Lewis and Clark Arrive Columbia River", Bronze, Portland Women's Forum Scenic Viewpoint. Image taken September 23, 2006. 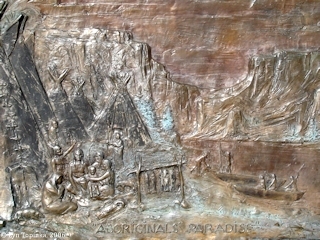 Click image to enlarge Detail, "Aboriginal's Paradise", Bronze, Portland Women's Forum Scenic Viewpoint. Image taken September 23, 2006.